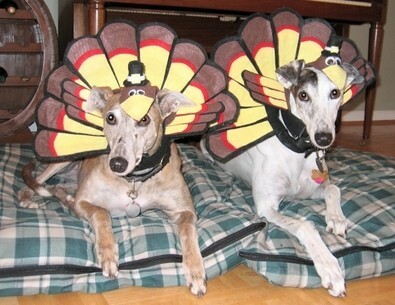 How will your dog be spending Thanksgiving this year? Most dogs find themselves smack dab in the middle of the holiday festivities. And many will be on the prowl for Turkey treats and dropped food particles! For the record, we don’t give our dogs table scraps or people food except when they are ill and need a special diet to combat diarrhea or vomiting. 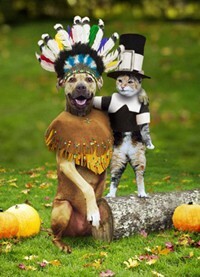 But that doesn’t mean you shouldn’t include your pet in your Thanksgiving activities. 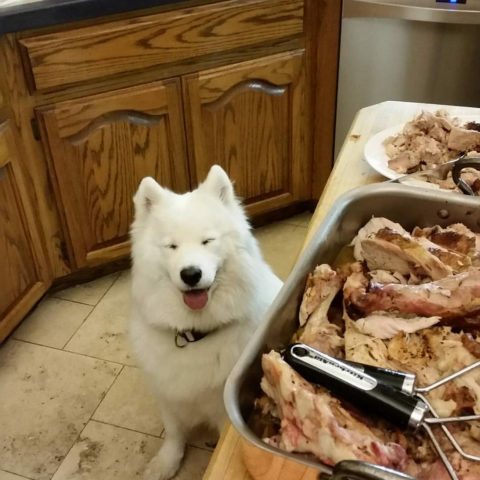 Dogs can have cooked turkey. Dogs can have small amounts of turkey skin. Dogs cannot have turkey bones (…just like chicken bones, they are dangerous to dogs). Ingesting too much turkey skin can lead to gastric distress and Pancreatitis (a serious inflammatory condition of the pancreas). Stay away from all the trimmings, which will inevitably lead to an upset stomach and diarrhea.